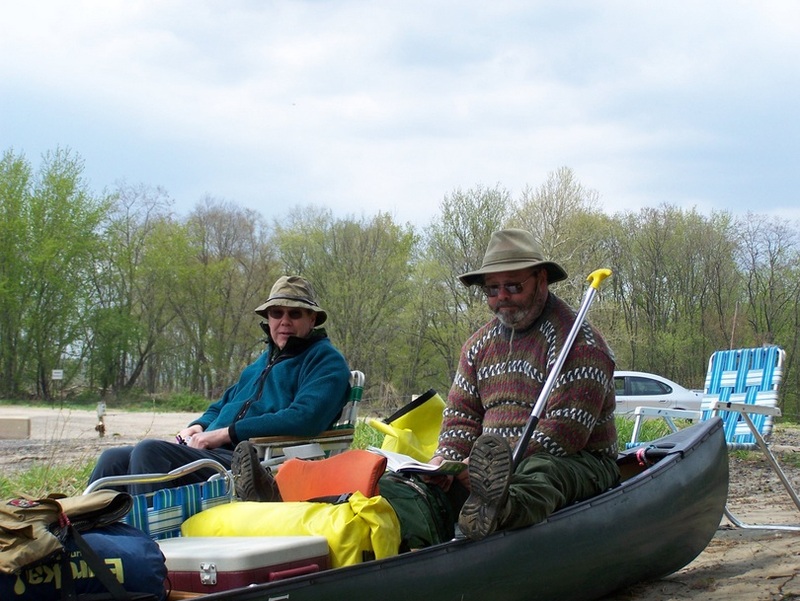 We got back from our canoe trip Sunday noon. We drove to Port Jervis on Thursday (5 hours), dropped off our canoes and stuff and shuttled the van to the take-out point at a campground in Portland, NJ ~50 miles away. Steve took a taxi back to Port Jervis. It was cool and windy while we waited. We got in the water at 3:30pm and paddled for 1 hour. We passed the Tri-State Stone marking the intersection of NY, NJ and PA.
We decided stayed at campsite #1 as it was starting to spit rain with predictions for more. 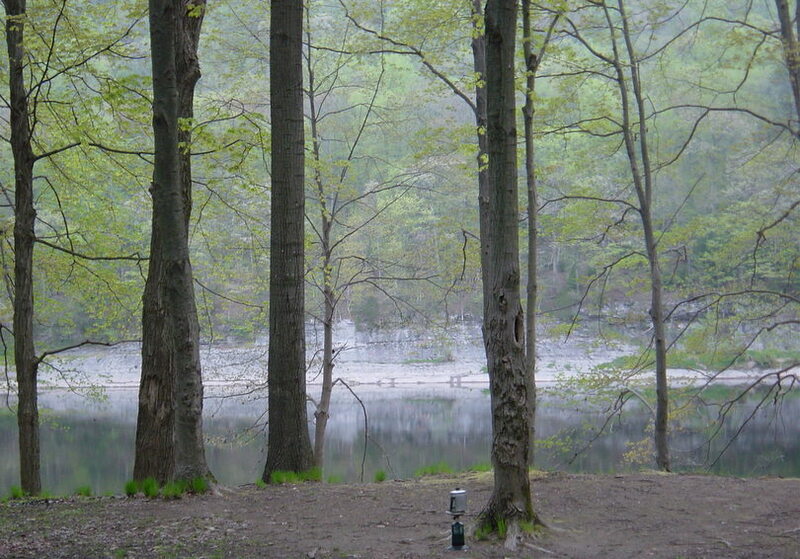 Campsite #1 was on the NJ side of the river with some camps across the water from us. One of the camps had a very vocal rooster that we heard at night and early the following morning. Knowing the weather forecast and schedule we picked up sandwiches for dinner to lessen our workload for the 1st evening. It rained heavy during the night, but stopped before we arose. Our normal routine included Bob making breakfast and dinner. Steve made coffee in the morning. Jim set up the rain tarp and Jim/Steve/Skip washed dishes. Below Steve is set up for early coffee. 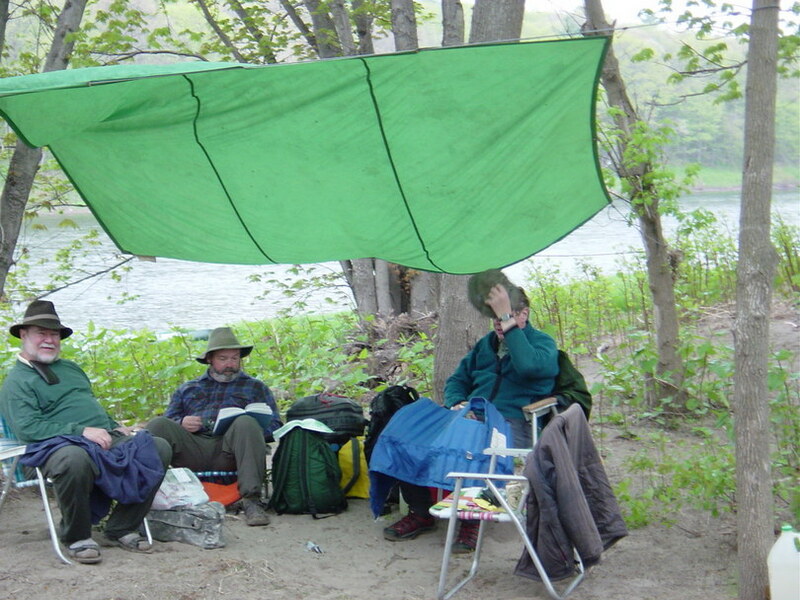 The Delaware River Water Gap National Park has designated campsites through out and several river side parks and boat access points. We expected to see other paddlers but did not see any other paddlers. However, there was a Shad Fishing Tournament that attracted a number of boats and shoreline fishermen. We paddled 25 miles on Friday and stayed at picturisue campsite with a large rock cliff adorned with blossuming dogwood across the river from our site. We saw 1 white swan, 6-8 Ospreys and 7-8 Eagles; lots of Canada Geese and ducks. 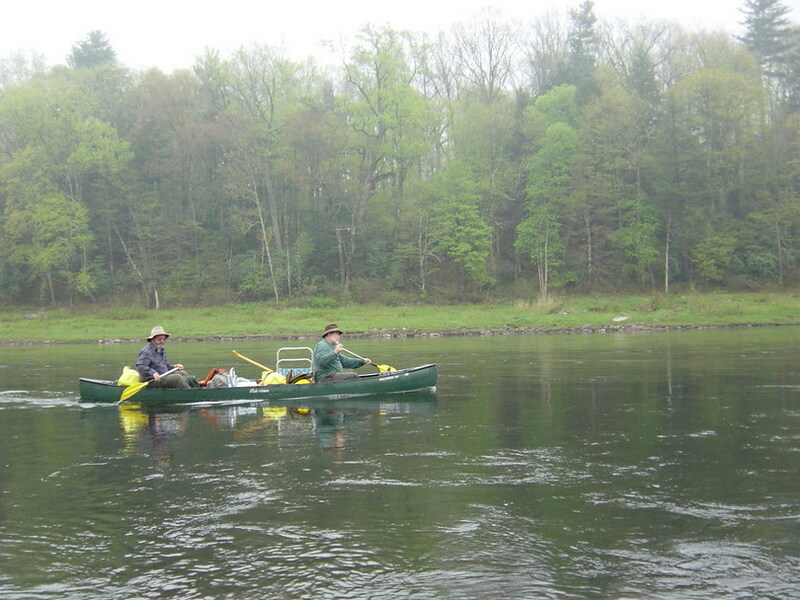 The river flowed along at 2-3mph so we enjoyed a good current helping us along. There were a few class II rapids and places with 1-2′ standing waves that splashed us but nothing dangerous or caused us to dump. We experienced temperatures in the mid-forties to mid-fifties. 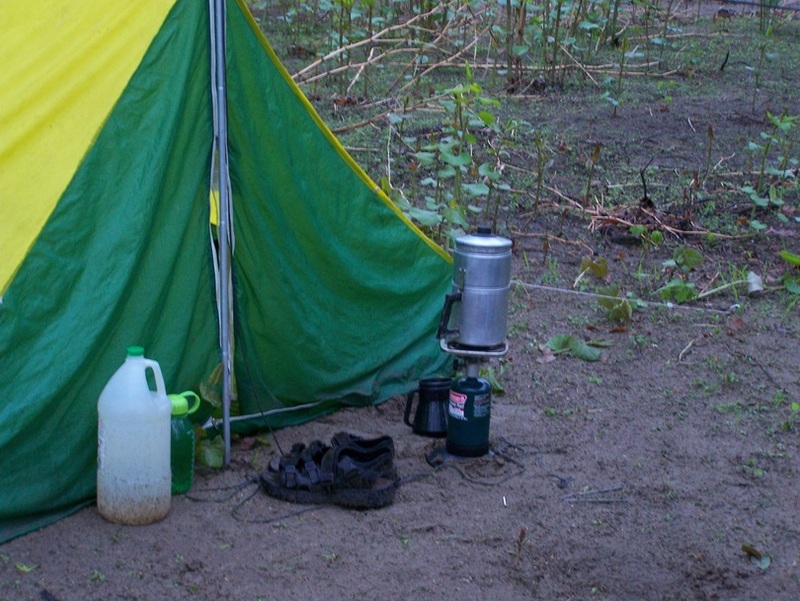 We were lucky in that we only got rained on during the night while we were in our tents or one morning while we were under the rain fly having breakfast. 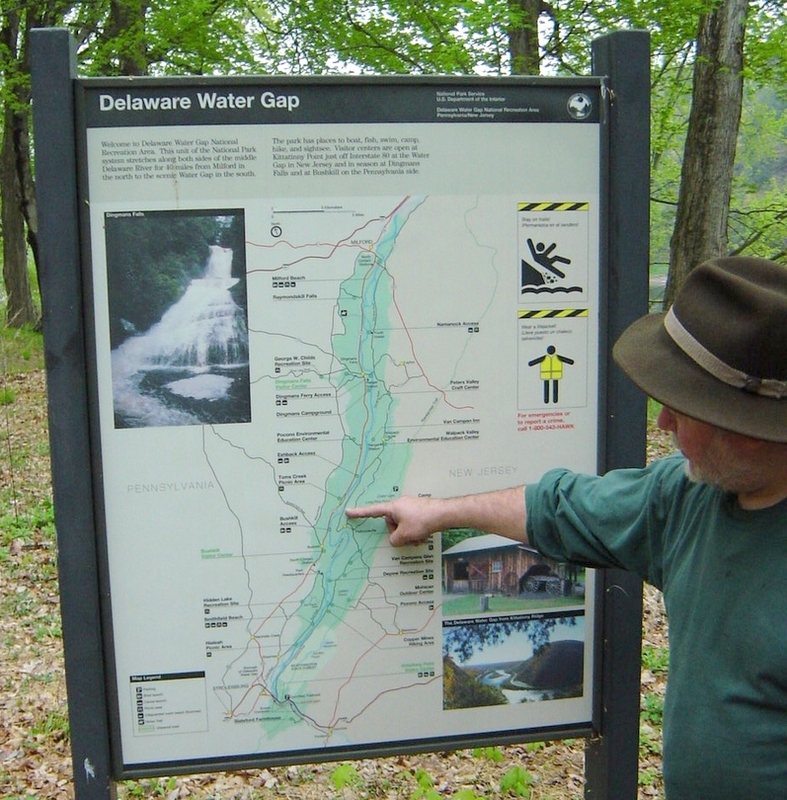 Delaware Water Gap is a deep, narrow gorge cut by the Delaware River in the Kittatinny Mountains. 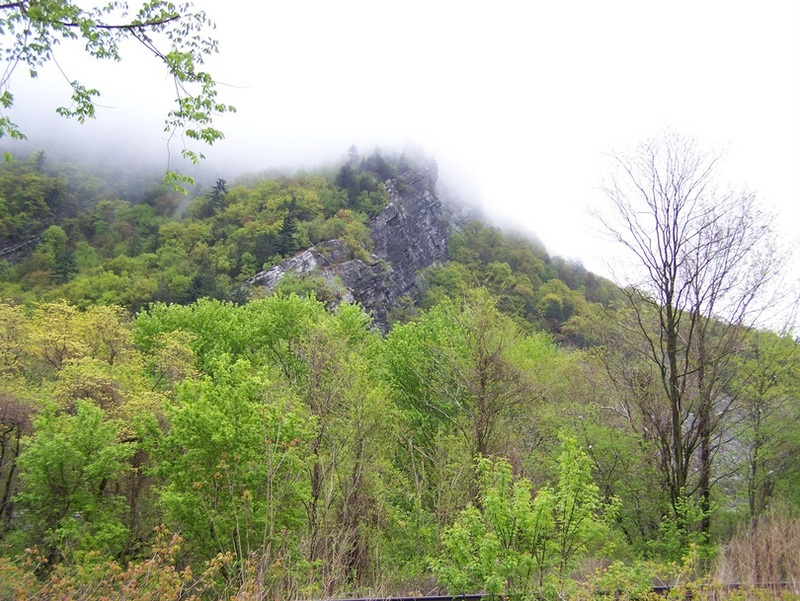 The gorge is three miles long, with steep, rocky walls which rise 1,400 feet on each side. 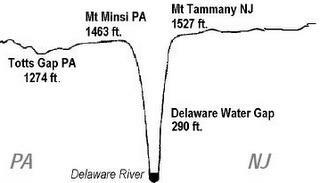 Mount Tammany is located on the New Jersey side of the gorge and Mount Minis on the Pennsylvania side. 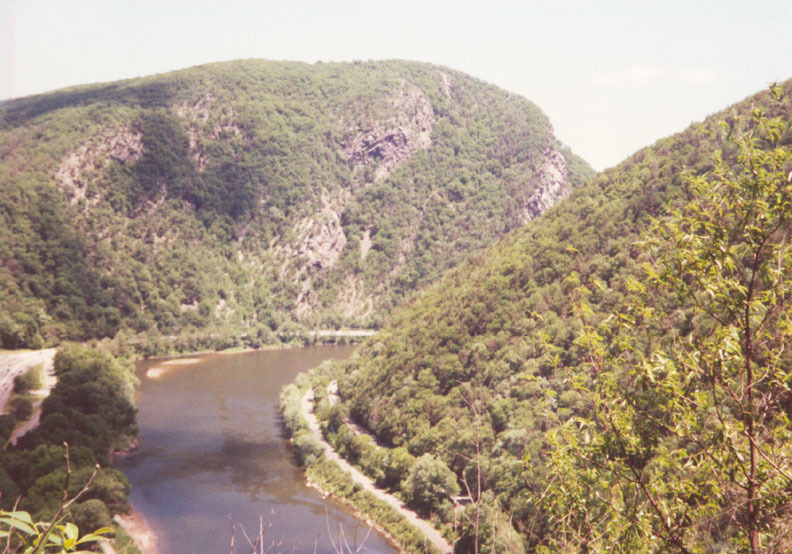 The actual Delaware River Water Gap was impressive with two large rock walls concentrating the river, Interstate 80, a railroad, and a state road. It was impressive, but the traffic noise from the interstate detracted from the experience. 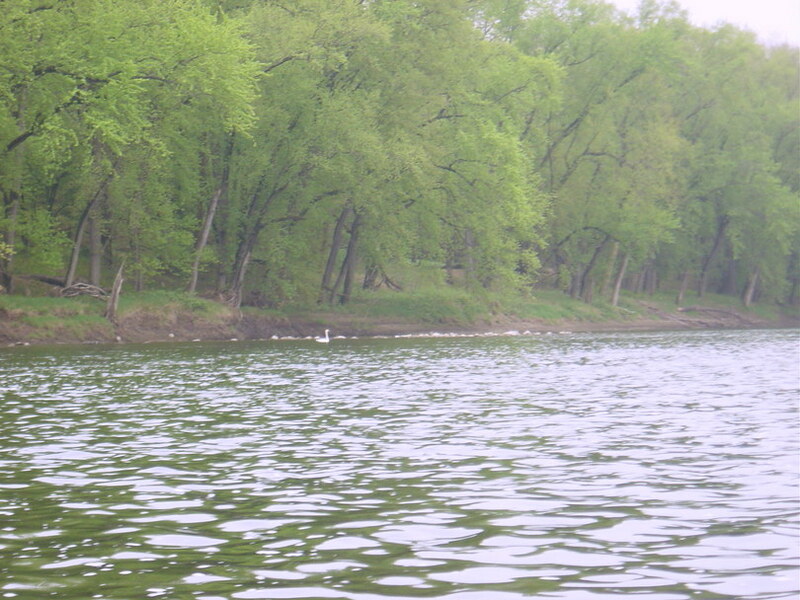 Saturday we paddled to the end point at Delaware River Family Campground. Just before the campground we went under a railroad bridge which had some largish standing waves. We all took on water over the sides of the boat – not bad, but it was sloshing around as we pulled the last few hundred yards to the Campground. That afternoon we showered, re-packed and prepared for our Sunday morning return.